Israel Olmo was a son of a rabbi from Ferrara. For a long time, Jews were not admitted to study at most universities. Doctoral diplomas virtually guaranteed Jewish physicians entrance into society of the early modern period. In Padua, Olmo was permitted to study medicine and he received this elaborately decorated, handwritten Latin diploma. 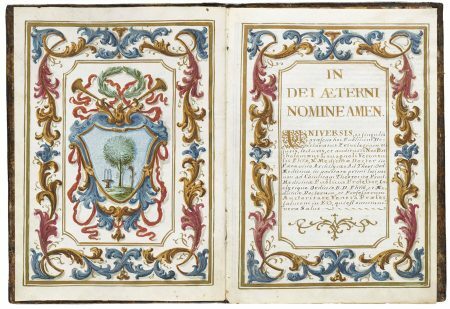 Doctoral Diploma, Israel Barukh Olmo, 1755, University of Padua, ink and gouache on parchment.